Good luck in your future endeavours. Thanks for your support and guidance. Thankyou for all your support and guidance. Best of luck with the role and appreciate all your efforts. Thanks so much for going in to bat for your staff with respect to their personal welfare and job security. Your personal interest in the goal of zero staff turnover is one of the best I've seen from all managers I've worked under. Its been a pleasure to be under your leadership and guidance over the past two and a half years. I wish you all the best in your new role. Good luck with your new job up on the hill. It's been a real pleasure to be part of your team for the last 6 months. Thanks for dropping by three years ago to give me the heads up about this job. The opportunities have been just as you said they would be without embellishment. It's wonderful to be part of a team with a great sense of purpose and autonomy. Might see you out RGP6 way, never know. Hope everything works out for you in the future and you achieve the things you want to. OB18 is a really great place to work and I know you've had a large influence on why this is. So thanks mate, and thanks also for giving me the opportunity to be a part of it. Best wishes in your new role and all your future endeavours. Good luck with your new job, I am sure if you work as hard as you did at NJV you will go very well. Thanks very much for that extra mile you have gone for myself in a number of areas, it will not be forgotten. Wishing you Mel and the boys all the best for the future. Thankyou for giving your support and guidance and helping me to get tougher with people. We may cross paths again in the future I'm sure. It's been a pleasure working with you in the NJVCM team. I say "with" because it never felt like you treated as subordinates which is a big difference from Canadian-style management and I believe it has helped us all to grow. Thanks and good luck. I'm sure our paths will cross again in the future. All the best in your new role. I have enjoyed the past 18 months working under your sincere and pasionate leadership. Keep in touch. Geez....those photo's probably were not the best to attach.....it has been a hard tour of duty for you!!! On a serious note, thankyou for everything that you have done over your tenure for Contract Mines - your experience, drive and passion will be missed. All in all - not to bad for a dutch man! Thanks alot for the opportunity to be part of the NJVCM team, especially at OB18. I appreciated your support, especially when Kerry was away in '09 and also for the opportunity to, briefly, fill in your shoes while you and Richard were overseas, on your respective junkets in Canada and S. Africa. Here's wishing you all the best in your new role at Norwich Park and for the future. All the best in your new role. Thanks for your support. 'Life's too short to drink bad wine'. Oh wait ... you've already nailed that one! so may the best of the past be the worst of your future. Thanks for being supportive to me from covering the Scheduling to checking the Monthly Claim of the Contractors. Just by asking if everything is alright makes a great difference and made me feel that you're there to support me as my Manager. Thanks for letting us grow on our respective fields. You're a great leader and for sure we'll miss you. I won't forget your shopping tip which is always look for the RED Tags. Good luck on your new role. I hope your transition to coal over east is as successful as mine intends to be! 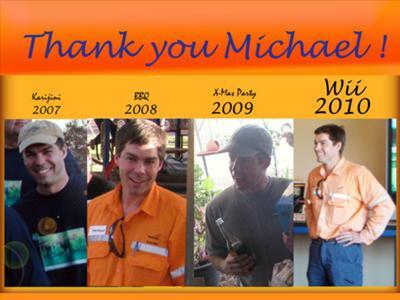 Best of luck Michael it has been a pleasure working with you. I wish you and family all the best and hope you have many good times ahead of you.